The NFL Monday night game on December 2, 1991 featured the team with the best defense in the league, the Philadelphia Eagles, visiting the club with the second-most-productive offense, the Houston Oilers. Philadelphia was coached by Rich Kotite, who had replaced Buddy Ryan, the architect of the defense, the previous offseason, and the unit was now under the tutelage of defensive coordinator Bud Carson. 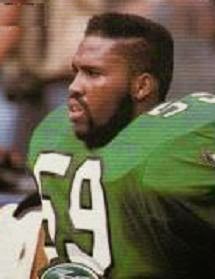 The line, anchored by DE Reggie White and including DE Clyde Simmons and DT Jerome Brown, was the key to the defense’s success, but there was plenty of talent at linebacker and in the defensive backfield as well. The offense was far less impressive, however, in particular after losing star QB Randall Cunningham to a season-ending knee injury in the first game of the season. Backup QB Jim McMahon was talented but brittle, and when he was forced to the sidelines, the team floundered with the likes of Brad Goebel and Pat Ryan in his place. But after dropping to 3-5, the Eagles caught fire and won four straight games to come into the contest in Houston with a 7-5 record and a shot at the playoffs. The high-flying Oilers, coached by Jack Pardee, were 9-3 and adept at rolling up offensive yards, especially at home in the Astrodome, which was thus dubbed “the House of Pain”. QB Warren Moon was a prolific passer in the team’s run-and-shoot attack and had a capable receiving corps. Philadelphia’s approach to stopping the offense was to use a 4-2-5 defense, dropping a linebacker and adding an extra defensive back on most downs. There were 62,141 fans in attendance for the nationally televised game at the Astrodome. The Oilers had the first possession and, on the second play, turned the ball over when Warren Moon fumbled and LB Byron Evans recovered at the Houston 33. However, the Eagles were unable to capitalize as Jim McMahon threw two incomplete passes and, in between, was sacked by DE William Fuller for a loss of 11 yards. Forced to punt, they buried the Oilers deep in their own territory. The teams exchanged punts before Houston, starting from its 20, drove into Philadelphia territory, helped along by a pass from Moon to WR Ernest Givins that gained 20 yards. However, WR Haywood Jeffires fumbled when hit hard by SS Andre Waters following a catch for a short gain. 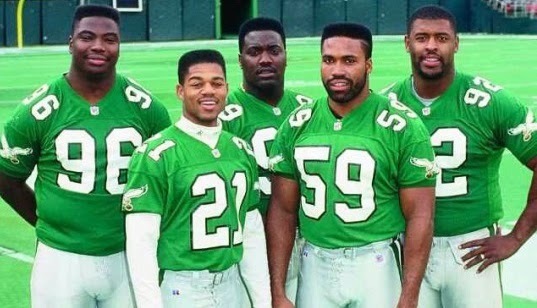 LB Seth Joyner (pictured at top) recovered and returned it to the Philadelphia 48. The teams again traded punts, with neither offense able to move effectively. As the scoreless game headed into the second quarter, McMahon completed three passes, the longest to WR Roy Green for a pickup of 22 yards, to reach the Houston 31. But FS Bo Orlando intercepted the next throw to end the threat. Philadelphia’s aggressive defense continued to thwart Houston’s passing attack, forcing a punt and, when the Oilers, benefiting from improved field position on the exchange of kicks, reached the Philadelphia 36, the Eagles forced another turnover. Joyner jarred the ball loose from RB Allen Pinkett and DE Clyde Simmons recovered. The exchange of punts continued until the Oilers, taking possession with 57 seconds remaining in the first half, advanced 33 yards in seven plays. Moon completed passes to Pinkett for 13 yards and Givins for 15 to set up a 42-yard field goal by Al Del Greco on the last play before halftime. Houston led by 3-0 at the intermission. 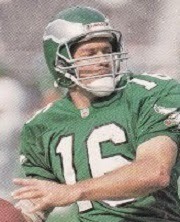 McMahon was knocked out of the game with an elbow injury during the first series of the third quarter and Jeff Kemp (pictured at left), who was claimed off waivers from Seattle in mid-October, came on at quarterback for the Eagles. Philadelphia had to punt but got the ball back on the next play when Joyner recovered a Moon fumble at the Houston eight. The visitors couldn’t reach the end zone in three plays, but they did tie the score when Roger Ruzek kicked a 23-yard field goal. The Oilers went three-and-out on their next series, unable to gain any ground at all from their 12 yard line. The resulting punt gave Philadelphia possession at the Houston 48. RB James Joseph ran for 24 yards on first down and, after a short running play, Kemp connected with TE Keith Jackson for a 21-yard touchdown. Ruzek added the extra point and the Eagles were ahead by 10-3. In response, the Oilers advanced 41 yards in seven plays as Moon ran for six yards and completed two passes, to WR Leonard Harris for eight yards and Jeffires for 22. The drive stalled at the Philadelphia 29 and Del Greco connected for another field goal, this time from 47 yards. The teams traded punts once more as the game entered the fourth quarter. The Eagles then put together a long possession of 50 yards in 16 plays, converting four third downs along the way and eating up over ten minutes. Kemp completed five short passes and Ruzek finished off the series with a 29-yard field goal that extended Philadelphia’s lead to seven points. With the clock down to 3:52 in regulation, Moon went to the air on every play but WR Drew Hill fumbled when hit by CB Otis Smith, who recovered at the Philadelphia 41. Another punt was followed by one last shot for the Oilers. Starting from his 23, Moon threw to Harris for 24 yards and had back-to-back 15-yard completions to Givins and Jeffires. But the game ended for Houston at the Philadelphia 23, where three straight passes fell incomplete. The Eagles won the hard-fought contest by a final score of 13-6. The Oilers, who failed to score a touchdown for the first time in nearly two years, had the edge in total yards (247 to 240), which was well below their season average thus far of 392.9 yards, and in first downs (15 to 14). But Houston also turned the ball over five times, all on fumbles, to one suffered by the Eagles. Philadelphia recorded four sacks, to three for the Oilers. Further emphasizing the defensive nature of the contest, the Eagles punted nine times while Houston kicked it away on six occasions. Seth Joyner, who had been battling the flu prior to the game, was the biggest star on defense. He recovered two fumbles, forced two more, and recorded two sacks in addition to eight solo tackles. Jim McMahon completed 12 of 20 passes for 84 yards with one interception and, in relief, Jeff Kemp also threw for 84 yards, completing 10 of 17 throws with a touchdown and none picked off. James Joseph rushed for 56 yards on 12 carries and Keith Byars, in addition to contributing 29 yards on 9 rushing attempts, led the Eagles with 7 pass receptions, although for just 19 yards. Calvin Williams had 5 receptions for 32 yards and Roy Green gained 44 yards on his three catches. For the Oilers, Warren Moon was successful on 24 of 46 throws for 262 yards with no interceptions but also no TDs. Haywood Jeffires caught 8 passes for 82 yards and Ernest Givins gained 89 yards on 6 receptions. The team accumulated just 21 yards on the ground, and Allen Pinkett led with 10 yards on 6 carries. The Eagles made it six consecutive wins the following week against the Giants, but a loss to Dallas in the next contest effectively eliminated them from the postseason. They ended up with a 10-6 record, placing third in the NFC East. Houston cruised to the AFC Central title at 11-5, marking their fifth straight year of making it to the playoffs, but after defeating the Jets in the Wild Card round, they lost to Denver at the Divisional level.